Is January 1 too early to start writing to Santasaurus? Not if you're Ernest B. Spinosaurus. Especially if you're Ernest B. Spinosaurus. Because - as much as he tries to be good - naughty just comes easier to Ernest. Like the time he gave his mom a box of chocolates... did she forgive him for the spider that was inside? And then there was that other incident... the one with the remote-control flying pterodactyl. 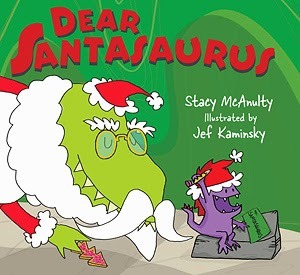 So, to make sure that Santasaurus knows he's trying to be nice, Ernest writes letters. Every month. He assures Santasaurus that he's being good. Those other things that happen? They weren't intentional. Really. Honest mistakes (in judgement). Forget about that glitter flue incident, says Ernest. And focus on the important thing: the Jurassic Turbo Scooter X9. To prove that his nice behavior outweighs his naughty, Ernest includes a bar graph (something I never thought to include in my Santasaurus letters). This is one fun book to read. Check out the book trailer below - it will have you laughing ho-ho-ho all the way to the kitchen, where those cookies for Santasaurus are waiting to be frosted. One December day a boy and his grandfather go for a walk. 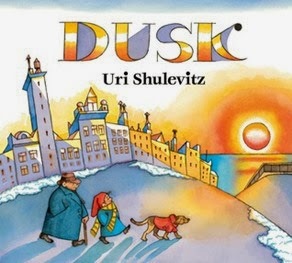 "Winter," writes Uri Shulevitz. "Days are short. Nights are long." As they walk into the night, lights come on one by one. It's only then that you realize: this is not just a quiet winter's eve tale. It's a holiday book! There are store windows to gaze into, children's parades, and street scenes galore that show a busy city getting ready to celebrate. Perfect for this time of year. The bears in our neck of the woods love to eat sunflower seeds and suet. They'll rip the covers off the honeybee hives, swipe the can of birdseed right off the porch, and have no qualms about riffling through the garbage cans for left over lo mein. But that's not the way they eat in the natural world. 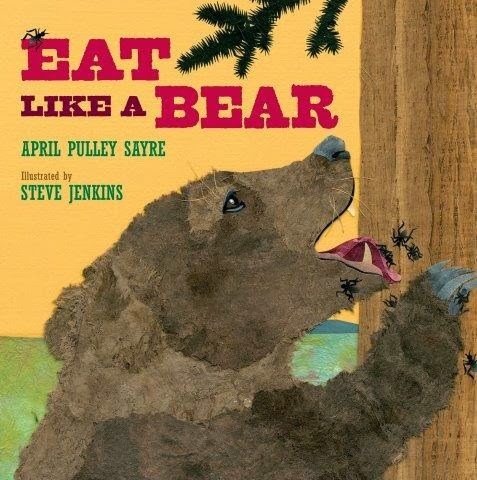 April Pulley Sayre shows a year of seasonal bear meals, beginning in April when bears wake up hungry. What's for breakfast? "Bushes? Bare. No berries there." So where will bear find food? Green stems growing above the snow; the carcass of a bison or deer that died in winter. In May it's dandelions, sedges, slugs and ants. In June it's trout... and July maybe some roots. The brown bear wanders through the months, digging in, digging down with paw and claw. By fall it's time to fatten up and find a den before the snows come. The illustrations - torn and cut paper - add texture... you can almost feel the shaggy fur of the brown bear. The back pages are filled with additional information about bears, the food they eat, hibernation, and scientists who study bears. Today is STEM Friday - head over to the STEM Friday blog to see what other people are talking about in science. But watch out for hungry bears! Review copy provided by publisher. Oy! I have been carrying this book around in my bookbag far too long. Because I love it. Because it's a book that is honest. Because ... how can you resist a book with a pie chart on the back cover that claims "this book contains 20% snark, 9% bizarre coincidences, 3% random musings and 7% manual labor at a Christmas tree farm". I think that's the thing that got me to open the covers - the working at a Christmas tree farm. Because my kids have planted them, and trimmed them, and watched them grow (or, in other years, be eaten by deer). This is a story of Sarah who lost her best friend, Jamie, in a freak accident. But that was a year ago and now it's time to get back to normal, right? After all, grieving is a process and there's seven steps and by the time a year's passed, one should be finished. But not Sarah. Her grades are plummeting; her relationships have gone sour; her voice has been replaced by a "snark box". 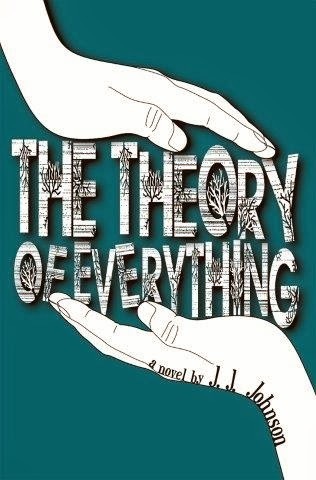 Until ... she reaches out to Jamie's twin brother who just might be the only person to really understand what she's lost. 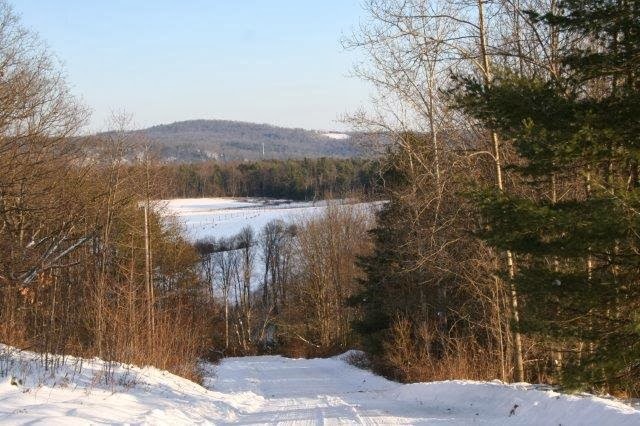 Sarah also finds answers while working on a Christmas tree farm... because sometimes, the best way to find your way back to yourself is through sweat and blisters. The story itself is good enough reason to crack open this book. But what makes it fun are the Venn diagrams and line graphs and flow charts and bar graphs and timelines - they open up a different window through which to view relationships. Not to mention it gives you some ideas for the next time your math teacher tells you to graph something. The book opens with a wordless spread: a boy all dressed up in his parka and cap, pulling a plastic toboggan across the dried grass of his front lawn. "Mom," said David, "when will it snow?" "I think soon," said Mom. "Why don't you help me make cookies while you wait." David helps Mom make cookies... but the fine, white flour makes him think of snow. So he races outside to check the weather. Only a few flakes falling. He bugs Mom again: "Will it snow taller than the grass?" In response, Mom asks him to help clean the bathroom. But the bubbles and foam from the cleaner spray (he gets a little exuberant) make David think of snow, so he races outside to check the weather. Beyond the Book: Why wait for snow when you can make your own snowflakes? All you need is white paper and scissors and a bit of imagination. Remember that snowflakes have six sides. Paper-folding directions and design ideas here. You can make your own snow globe. You need: a small glass jar with a good lid that's leak-proof (baby food jars work well); glitter; small plastic items or figures to put in the jar; water; glycerin or mineral oil; and a hot glue gun. Glue the figures for the scene onto the lid of the jar & let it set. Then fill the jar 3/4 full with water (add a bit of glycerin if you want) and add a pinch or two of glitter. Screw on the lid and watch the snow fall. Hint: if your lid isn't leak-proof, use some pipe thread tape to line it. Check out Archimedes Notebook for ideas on how to turn your snow globe into a science experiment. Today's review is part of PPBF (perfect picture book Friday), an event in which bloggers share great picture books at Susanna Leonard Hill's site. She keeps an ever-growing list of Perfect Picture Books. Review copy provided by publisher. Hanukkah in Alaska can sure be different. 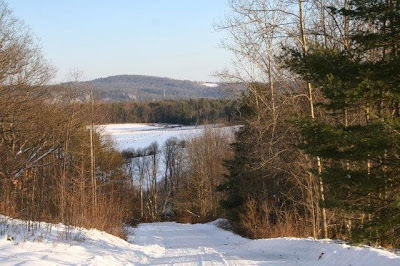 For one thing, you've got to watch out for moose - and the girl narrating this story tells us what to do when you live where moose live. You drive slowly, because they can really put a dent in your car. And if one comes by the playground when you're playing - hug a tree! A moose can't step on you if you're hugging a tree. Now it's the last night of Hanukkah. Dad says, "Let's go outside." But that darn moose has been hanging around all week long, eating the tree. Still, dad says it's OK and they'll stay fa-a-ar away from the moose. The girl pulls on her thermies and flannel shirt and sweater and snowpants and... finally they head outside. And there, up in the sky, a rainbow of light ribbons shimmering in the air. The northern lights - a Hanukkah Festival of Lights as only the far northern sky can provide. And when the moose interferes, the girl comes up with a special Hanukkah solution. 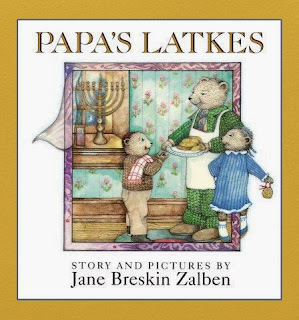 This is a fun read-aloud that will make you want to bundle up and head outside to see what's in your Hanukkah night sky. Advanced reader's copy provided by publisher. Opening: "Mama made the best potato pancakes in the whole town. 'This Chanukah,' she said, 'I don't feel like making latkes.' So papa said, 'Let's have a latke contest!' "
Why I like this book: How many ways can latke-making go wrong? When the kids try their hands -er, paws - at whipping up potato pancakes, we find out. Too lumpy! Too oily! Too large! Too small! But when papa steps into the kitchen the latkes come out just right. There is light (the menorah) and music (O Chanukah) and dreidel-spinning and shiny new frying pans. Sing! The words and music for "O Chanukah" are in the back of the book. Dance! The Hora is a simple circle dance that anyone can do. Here's how. Roll some candles for the menorah. All you need are some sheets of beeswax and wick. Here's how. This is a fun picture book bi-og-ra-phy [noun: a written history of a person's life]. While authentic – it’s based on lots of research – the dialogue adds a touch of fictionalization. * But a great story about a guy who loved language and wanted to document American English as a separate language from the King’s English. Noah does not want to be a farmer like his father and his father’s father. Instead, he wants to be a schol-ar [noun: one who goes to school; a person who knows a lot]. The most controversial thing Noah did was to push the idea of standardized spellings and word usage. Prior to his spellers and dictionary, people wrote words the way they sounded. That meant a single word might be spelled three or for/four/fower/fore ways. Webster also decided that since this was a new country, we needed new and simplified spellings. Instead of “plough” he wrote “plow”. The story is interspersed with dictionary-like definitions, and the back pages are a treasure trove for word lovers and nonfiction aficionados. There’s a detailed timeline in which “facts are explained”. Highlights include: the Boston Massacre, Tea Party, fighting in the Militia against the Brits and, always, working on his ultimate word book. There is an Author’s note with even more facts, including Webster’s opposition to slavery and his advocacy for the first copyright law. 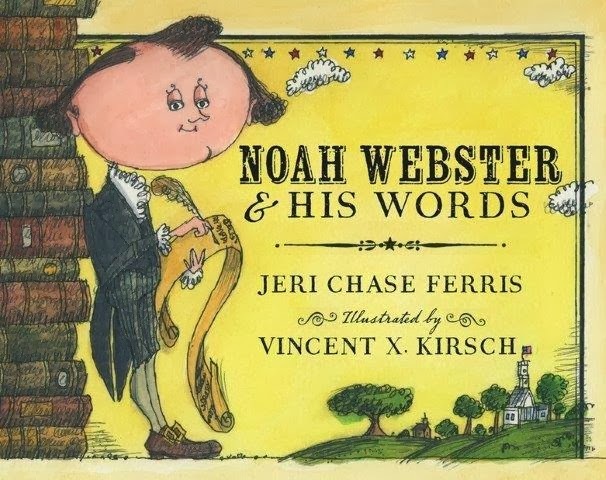 We learn that Webster was a teacher, lawyer, County court judge and founder of Amherst College… not just the guy who wrote the book we have to memorize before the SAT’s. The author includes a list of primary sources and some websites for kids (and their parents) who want to learn more. Although this book is aimed at the 4- to 8-year old crowd, I think kids in 4th & 5th grade will get a kick out of it – especially if you pair it with Frindle, by Andrew Clements. Frindle, you might recall, is a story about a boy who makes up a word and then tries to get it included in the dictionary. Find some old dictionaries at a used book sale and let kids cut out (or tear out) a favorite word to incorporate into a drawing/painting/collage. Collect words in a can – words that are neat, unusual, or just sound cool. Use the words to write poetry, as story-starters, or just to share and listen to the cool words. Play Text Twist, Boggle, Scrabble Slam or other games. Check out more Nonfiction reads today over at Jean LittleLibrary. Review copy provided by local library. Today's Theme: Holidays! Especially Thanksgiving. Next week we gather together to share food and stories. If you're looking for some good tales, try these... I headed down to the local library for a couple old favorites. Nothing better than reading a story (or listening to one) while waiting for pie. But when they come to the place where the land ends and the sea begins, the Yah-qua-whee go on a rampage, trampling and destroying everything. The People, the smaller animals and the Great Spirit join together to fight the huge giants. There is a huge battle and the ground is churned up into a muddy bog with much blood spilled. 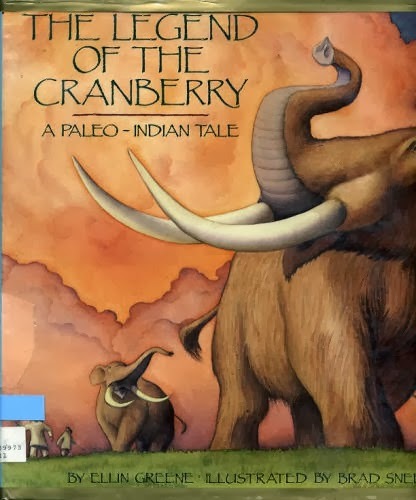 In the spring, the bogs where the mastodons were buried bloomed pink with blossoms that ripened into bitter-tasting blood red berries. The people discovered that the berries could be crushed and mixed with dried meat and fat to make pemmican. Poultices from the berries helped heal wounds, and the juice of the berries made a rich dye for clothing. Thousands of years later, descendants of those People offered berries to hungry Pilgrims. 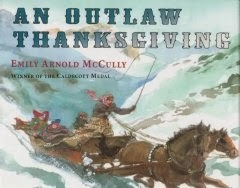 If you are looking for a different sort of holiday book, check out An Outlaw Thanksgiving by Emily McCully. It's based on a true incident in the 1890's Wild West, when Butch Cassidy and his gang threw a Thanksgiving banquet for the ranching community that was their favorite "hideout". McCully imagines this feast through the eyes of a young girl traveling from New York state to California. A blizzard stops the train and Clara ends up sharing dinner with Butch and the gang. Puts a different twist on the whole idea of cooking up a turkey and "inviting the gang over". Activities ~ Make some Cranberry Ink! When soldiers in the Civil War ran out of ink to send home letters to their loved ones, they smooshed up some berries and used the juice as ink. You can use cranberries - the recipe's over at Archimedes Notebook. 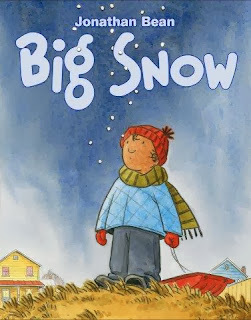 Today's review is part of PPBF (perfect picture book Friday), an event in which bloggers share great picture books at Susanna Leonard Hill's site. She keeps an ever-growing list of Perfect Picture Books. Review copies obtained from a library. In 1848 an ordinary boy flew a kite across Niagara Falls and helped build a bridge. His name was Homan Walsh and he was 16 years old. He built the kite for a contest - a contest sponsored by the US and Canadian bridge-building companies to generate publicity for their endeavor of building a bridge to span the falls and connect two nations. There were news articles, and later the event was included in history books. But author Alexis O'Neill wanted to tell the tale from the Homan's point of view - a kid who was caught up in the (air) currents of history. Homan loves to build kites. What seems like play to his father ("Apply yourself, Your studies must come first.") is filled with learning: "reading the wind, calculating lift, gauging line length...". We see Homan building his kite from the spars up, cutting the sail from calico in Mother's sewing basket, adding tails and finally twine - more than a thousand feet to reach across the gorge that separates Canada from the US. There's adventure, too. After determining that the best wind comes from the Canadian side, Homan rides across on the ferry. Like any good adventure story, his first attempt fails, and he is trapped across the gorge by ice that halts ferry traffic for days. But does Homan give up? No - when he finally gets home his first order of business is to repair his kite and try again. There's a lot at stake in his venture: prize money and a chance to go down in history. This is a true story. But, says O'Neill, the dialogue is created to "express emotions that are not obvious in the straight narrative accounts of this event." In her back matter she outlines what is known about the facts of the event, and what is not known. For example, in her story she mentions a handbill advertising the kite contest. While there was a contest, no one has found evidence of how the contest was promoted. Handbills - like the flyers of today tacked to telephone poles - were a common way to announce things. 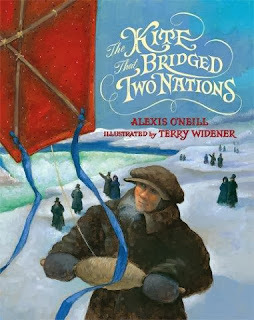 O'Neill includes a timeline of the bridge construction, adds sources and websites for further exploration, and even provides a link on how to build your own barn door kite - the kind that was popular when Homan would have built his kite. Which leads to this question: While a true story, is this nonfiction? Dianne White asked O'Neill about this very issue in a recent interview posted at ReaderKidZ. O'Neill's resoponse: "... if a writer makes up even one teeny, tiny thing that can’t be verified (a piece of dialogue, a neighbor’s name, an emotional reaction), the piece becomes fiction. Nonfiction means that everything is verifiable." She calls her story "historical fiction". But since it is about a real person, and is factual, other people would consider it a "fictionalized biography" - meaning that the story is pretty much true except for some dialogue. Check out more Nonfiction reads today over at NC Teacher Stuff. Review copy provided by publisher. There were too many clouds in the sky for me to see the solar eclipse earlier this month, so I dug into my reading basket for something about space. Rocket Man is the story of the first of many of my space heroes - John Glenn. Glenn wasn't the first man to go into space, but he was the first US astronaut to orbit the earth. And he's the one I remember... watching the tiny black and white TV set up in the school auditorium to see the blast-off and, later, wondering whether he would make it safely back to earth. A couple years later we'd be watching Captain Kirk on the bridge of the Enterprise... but in the real world, space exploration was just beginning. 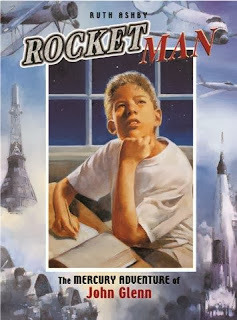 Rocket Man follows John Glenn through his Navy pilot training and into the astronaut training program. He was one of the "Mercury Seven", pioneers of manned space flight. Ruth Ashby describes the tough training programs and some of the disappointments of the early years: rockets exploding, the Soviets sending a cosmonaut into orbit first... would the American space program get off the launchpad? 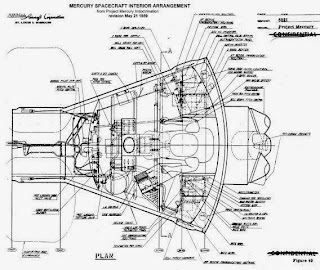 When Glenn finally did get into space - in a Mercury capsule so small that it was barely big enough for one person and the instrumentation. Things were tense for awhile when Mission Control wasn't sure the heat shield was OK, but Glenn managed to make it back through the atmosphere for a splashdown without burning up. Ashby ends the book with information about the space program and provides resources for curious space cadets. Space exploration has changes over the past 50 years, with an international space station and astronauts who tweet and send videos back to students on earth. 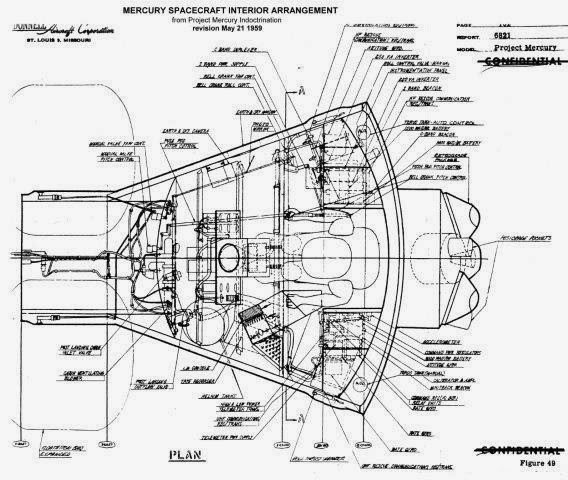 Check out my post about another astronaut over at Archimedes Notebook. And check out STEM Friday to see what other folks are reading. Review copy provided by publisher. On the morning of December 11, 2005, a fisherman came upon a Humpback whale tangled in crab-trap lines. He was about 18 miles off the coast of San Francisco. “Whale in distress!” he calls over his radio. On shore, Captain Mick picked up the call and contacted the Marine Mammal Center. A volunteer rescue crew rushed to Captain Mick’s boat and they set off to do what they could. 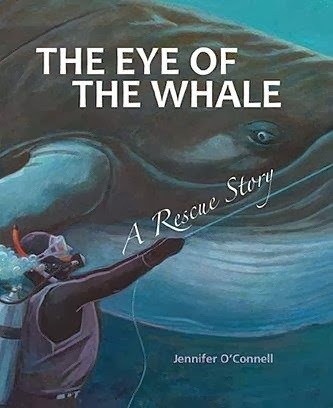 When the rescue crew got to where the whale was supposed to be, all they could see was ocean and a single sea lion. Then a puff of mist shoots into the air. They realize that the whale is floating, not moving. Lines, wrapped around the whale, cut into her skin and trap her. She can’t even swim to the surface to breathe. Undeterred, the crew begin their rescue operation. It's tricky: how does one liberate a 50-foot whale so that she doesn’t take off swimming before the team is finished cutting all the lines? How do they make sure they stay safe? But they do it, and the whale disappears down, deep under the water. This week's Nonfiction Monday is hosted by Wrapped in Foil. Bloggers who love children's nonfiction will share the cool books they are reading over at her site. Review copy provided by publisher. Shark Babies in the Ocean! Shark Baby lives in a works of “stripes and shadows, where seahorses played,” writes Ann Downer. He’s impatient to get out of his egg case and see the wide blue ocean. Then, even before he hatches, a storm snaps the egg case free of its attachment to kelp, The current bounces him off rough coral and drags him along the bottom of the sea. All that tumbling rips a hole in the egg case and Shark Baby can see spots. “What are you?” asks Shark Baby. The spotted shark answers that he’s a horn shark. 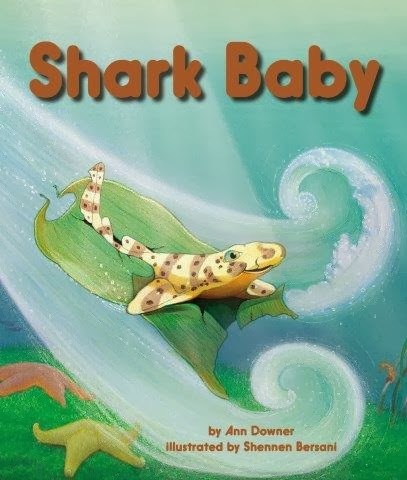 “Maybe I’m a horn shark, too, says Shark Baby. But horn sharks have spiral egg cases, and Shark Baby’s is a flat “mermaid’s purse”. When he sees a striped pajama shark he thinks he might belong to that sort of family. Then he’s advised by a wise octopus to seek the mermaid; she will have the answers. Shark Baby meets other sea creatures and eventually makes it home where he hatches and learns what kind of shark he is. Though the story is fanciful, it’s backed up with four pages of shark information, fun facts, and a comparison of different kinds of shark egg cases. This is part of the STEM Friday round-up. Check out the other science books and resources reviewed this week. Review copy provided by publisher.